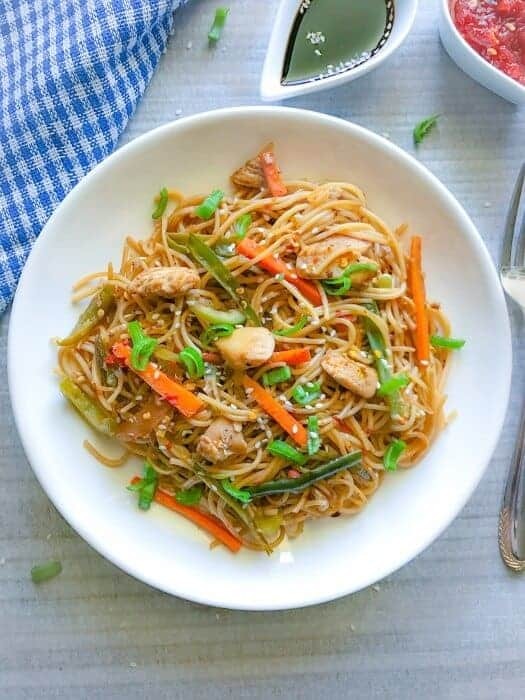 Quick Spicy Chicken Chow Mein Recipe (Easy and Lighter Version) a popular street style chow mien / lo mein recipe with veggies, chicken and eggs. It’s lightly sauteed with noodles for that crisp and refreshing taste. Hi Everyone and I know I usually don’t post a recipe midweek, but this Quick Spicy Chicken Chow Mein Recipe (Easy and Lighter Version) is special!! We are celebrating the Chinese New Year at a friend’s place and I’m taking my famous chicken chow mien. Every year, we get together and celebrate Chinese New Year at one of our friend’s place, who is from China. It’s such a fun and lovely celebrations with lots of food, wine, beer and tons of laughter. 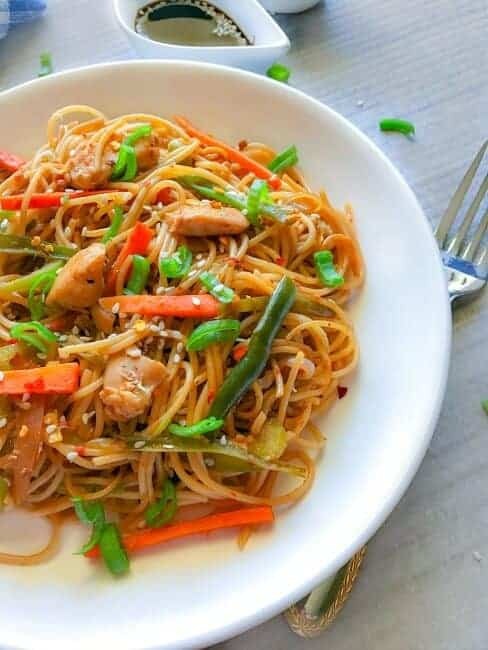 All through my lovely friend cooks all the main Chinese dishes at home but as she loves my version of these Quick Spicy Chicken Chow Mein Recipe. I have been cooking this particular version of the spicy chicken chow mien since ages and it impresses one and all. It’s so simple to make and the only thing I do differently is to add extra veggies. 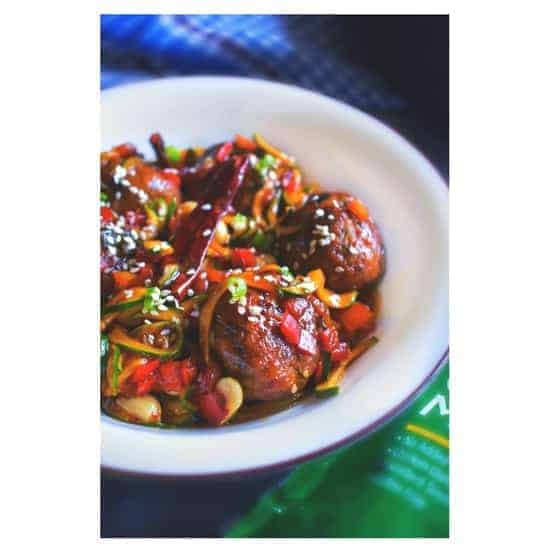 The ones you usually eat in Chinese dishes like carrot, scallion, onions, peppers, beans, chili and my secret ingredient for that spiciness – “Schezwan/Sichuan Sauce”. Before, you ask, I make my own schezwan sauce which I’ve learned from my mom and here’s the recipe. It’s this sauce, that gives this chow mein such a zing that it’s almost impossible to eat it just once, cause you’ll be craving it again and again. This particular recipe is so famous in the Northern part of India, that you would find it in the biggest of the restaurant to the most common street shop. And, I guess, if you’ve grown up studying in India, then it’s a staple of every student (school/college). During my college days, it used to be a weekly treat with friends. – Yep, we loved it that much! It was way too oily, way too spicy but gone are those days and I just cannot handle that much oil/spice anymore. So, I created something that we could eat easily without thinking twice and hence the Spicy Chicken Chow Mein Recipe. Although I’m using the regular chow mein noodles / Hakka noodles, you can use wheat noodles too. I usually use the same pot to cook the vegetables, chicken, and eggs and then finally sauteeing everything along with noodles to add that extra flavor to the final dish. I also use less salt as the soy-sauce already has salt in it, so you may want to do the same. While boiling noodles add 1 tsp oil. Once the noodles are boiled, sieve and drizzle another tsp of oil on them. 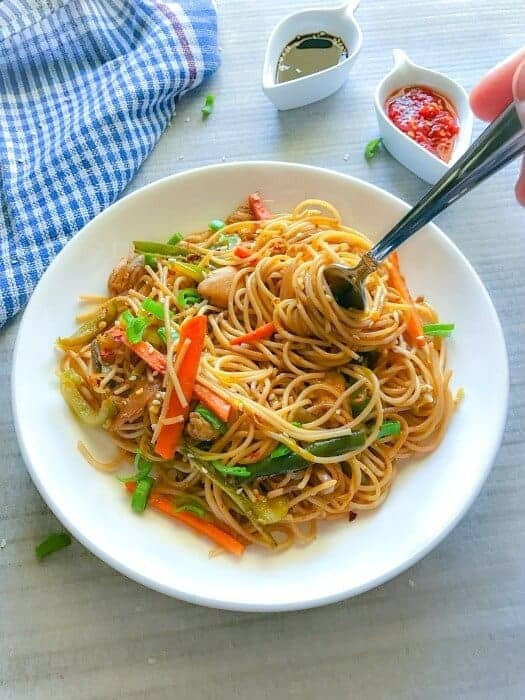 So, I hope you get to try my Spicy Chicken Chow Mein Recipe soon and do let me know by tagging #easycookingwithmolly on any of the mentioned social media. 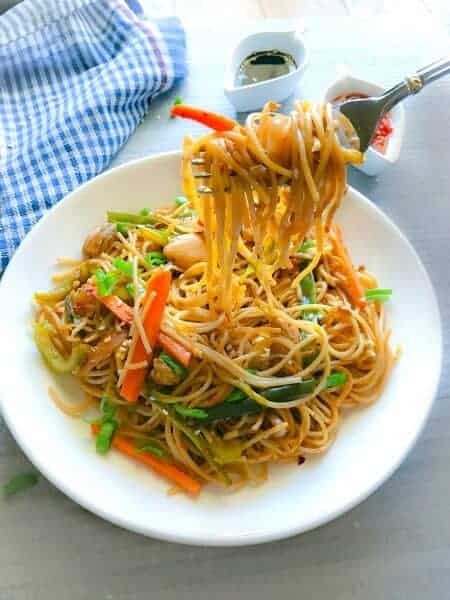 Quick Spicy Chicken Chow Mein Recipe (Easy and Lighter Version) This is a popular street style chow mien / lo mein recipe with veggies, chicken and eggs. Heat a wok and add 1 tbsp oil. Add all the vegetables and saute on high flame for 3 minutes. Add 1tsp oil to the same wok and add the whisked eggs. In the same wok, add 1tbsp oil and saute the chicken for 3-4 minutes (till nicely browned). Now add all the sauces and salt, pepper and saute everything for a minute. Add the cooked vegetables, eggs and saute everything for 2 minutes (medium heat). Finally, add the cooked chow mein and saute everything for 2 minutes. Turn off the heat and transfer the chow mein to serving dish. Sprinkle with scallion and sesame seeds. 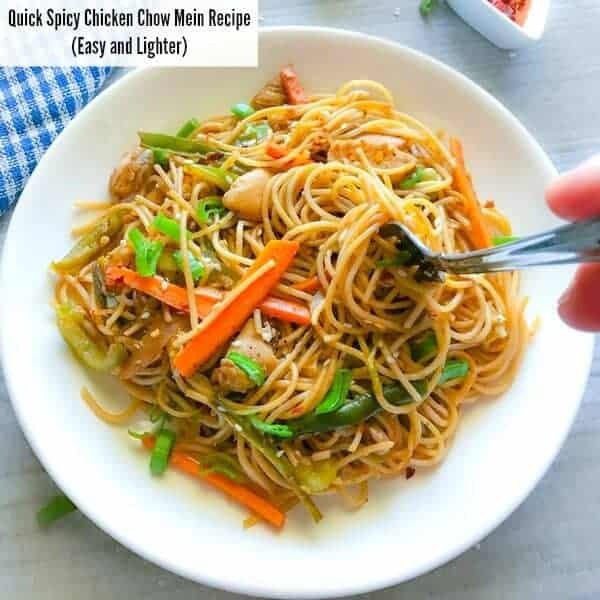 21 Replies to "Quick Spicy Chicken Chow Mein Recipe (Easy and Lighter Version)"
Your Spicy Chicken Chow Mein looks incredibly delicious and colorful. Thanks for sharing the recipe! Can’t wait to try! This looks so yummy and easy to make! This might be dinner tomorrow. This had me licking my lips and feeling hungry instantly.Going to make it tomorrow. Just need scallions. I always forget about making Chow Mein. It’s so easy to make and so flavorful. I’m going to add this to my list. Thank you my friend. This looks so delicious! I am always looking for a good chow mein recipe and I love that this is an easier and lighter version! Anything that is easy to cook is up my alley so thanks for sharing! That looks so good!! I will definitely try it. Thanks for the recipe. I’m a huge fan of chow mein and lo mein yet have no idea what the difference is. Your recipe turned out deliciously. Thank you for sharing this recipe. I am gonna give this a try. 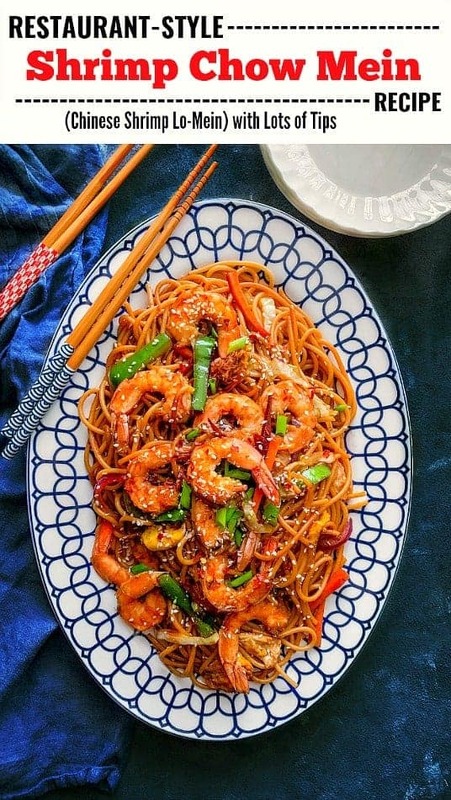 I have not made Chow Mein, I appreciate you sharing this recipe. Vegan here. Looks like a great recipe, my friend could use it. Thanks for sharing. This looks good. I have never made chow mein before. I would skip the spicy part. Are these regular noodles or special ones? Thanks Rose and you can use any kind of noodles with these. I’ve used regular noodles. I love chicken as long as it’s not too spicy! I hope that this recipe isn’t too hot and spicy or I’ll definitely try it. Otherwise, it sounds wonderful! This looks so delicious! I’m all about spicy foods so I know I’d love this one. I’m pinning for later!